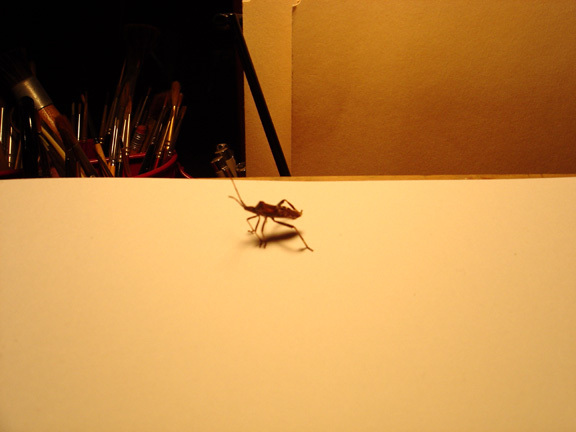 Oftentimes stink bugs or lady bugs like to visit me while I’m working late a night at the drawing board. I enjoy their company and will put a drop of clean water on a ceramic palette for them so they can have a drink. Colour studies and dummy for Pupper! 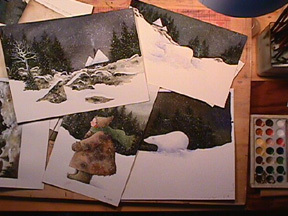 Colour studies for my book It’s Snowing! When I work on large, medieval maps I prefer to work outside. The maps can be quite large and the process is a bit messy. I tend to draw and paint with both hands at the same time. 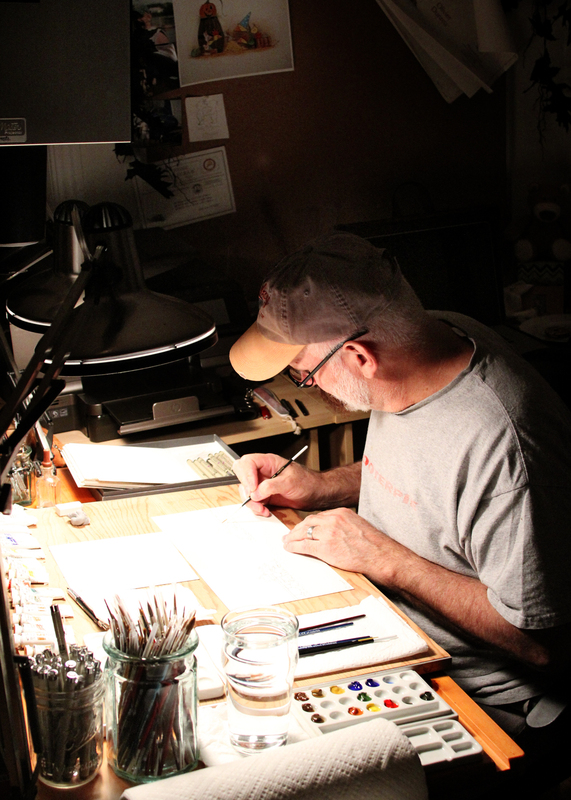 I thought it might be interesting to post a few photos of my drawing board and me working at the drawing board. I am what you call a “white knuckle” illustrator—always in a near panic when I’m working on the illustrations for a book. I am NOT a relaxed illustrator. Trust me, writing comes much more easily and more naturally to me. My temporary studio in the living room when I was working on the finished illustrations for Gemma & Gus and Gus. Molly had just had leg surgery and could not go up and down the stairs. So, I moved my studio down to the living room and slept on the couch for six weeks while she recovered. I work on a number of illustrations at the same time—this helps me keep the colours consistent. This photo shows a picture-in-progress. This is my original journal that I wrote when I was seventeen years old. It is the basis for my edgy, coming-of-age novel: 4″ written under the name Gabe Hooton. 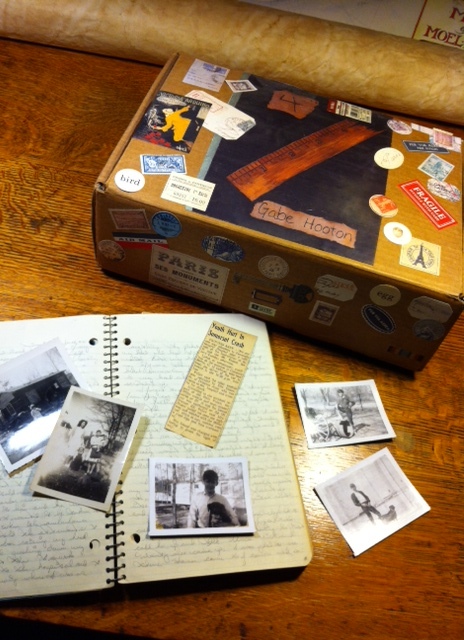 This photo shows the journal, old photos, and the box in which I keep the manuscript. You can read 4″ at amazon.com. Just search by title and Gabe Hooton. 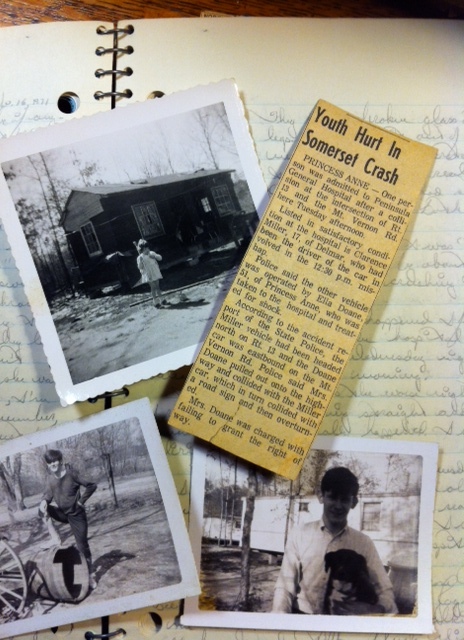 More old photos of my life when I was a teenager and the actual newspaper clipping that reported the near fatal car accident I was in. 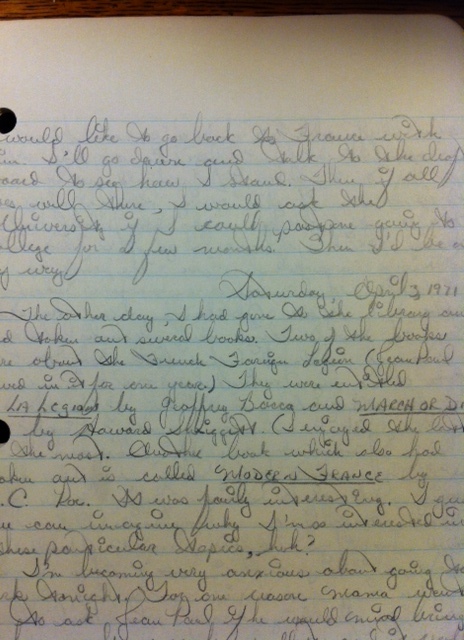 This is what my handwriting looks like in the journal from 1971. It’s another cold, wet, foggy night here at Henwoodie. The bleak, dreary weather fits my sad mood perfectly. The snow is melting but the days and nights are still chilly and damp. Still having difficulty sleeping after Molly’s tragic drowning. Still have not found her body in the swollen river that still has ice sheets on it. Will try to settle down in the studio later on today and attempt to get some real work done. I need to keep my mind distracted and not think about Molly. Not an easy thing to do, I must admit. 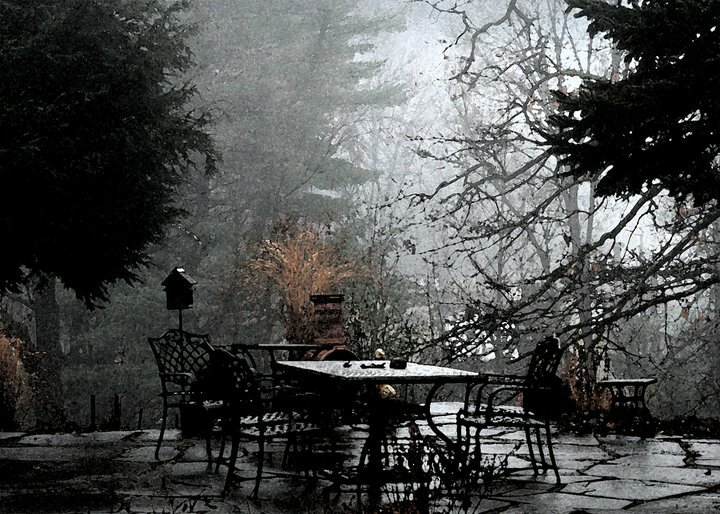 I like to remember these cold, foggy nights so that I can describe them in my writing, especially Wythe’s End and LOME. Eric Hemmers: Ever since I first met children’s book writer and illustrator, Olivier Dunrea, many, many years ago, I have been fascinated by his stories. He seems to have an endless supply of them and I have been fortunate that he has agreed to sit down with me over a period of several months in order to answer all my questions regarding how he works as both a writer and illustrator as well as gaining insights as to where his ideas come from. Olivier’s gentle, and sometimes off-the-wall, humor is something that stays with a person for a lifetime. At least it did with me. Olivier, what I remember most about you that very first time I met you when I was a young boy was your seemingly boundless energy and enthusiasm for what you did, everything you did, and how you shared your life and laughter with everyone you met. It’s difficult to believe that you live such a quiet, reclusive life now and have disappeared from the public’s eye. I know that you haven’t granted any interviews in twenty years and I appreciate your taking the time to let me bombard you with even more questions about your life and work. I appreciate it very much. Olivier Dunrea: Eric, I am more than happy to answer your questions and I appreciate your interest, believe me. Not all that many people are interested in the behind-the-scenes aspect of a children’s book. I must admit that I really am more reclusive, and always have been most of my life, but when I was younger and needed to support myself doing book signings, speaking at schools and conferences really did bring in much needed income. It’s tough being a fulltime writer and illustrator, especially at the beginning of your career. I always told my audiences that I earned more money talking about what I did than doing what I do. And that is a very true statement. So, where do you want to start this conversation? EH: I remember you telling us that when you came to my school! We all thought that you were a rich and famous writer and wanted to be just like you. One boy asked you outright how much money you made and I’ll never forget your reply. You told him that you did what you did because you loved doing it and not for the money. And in typical Olivier fashion you told him that his weekly allowance was probably more than what you made as a published writer. OD: [laughing] I used to get asked that question quite a lot. I think people think that ALL writers receive huge advances, millions of dollars, and they assume that all writers are just naturally famous right away. I felt it was important to let people know, especially children, that I didn’t write and illustrate because I wanted to be rich and famous (even though I wouldn’t have complained if it happened). I wanted to emphasize that writing, telling stories, making pictures was simply something that brought me great pleasure and was something I would do even if I couldn’t make a living at it. I am one of the fortunate ones that has survived on my writing and illustrating without having to have a day job. EH: Your books are now published all over the world. It must be exciting to think that children everywhere are reading your books and loving them. I wanted to ask you a simple question: Why goslings? When I first met you your passion was for chickens, pigs, and prehistoric Scotland. Where did you get the idea for creating the wildly successful Gossie & Friends series of books? OD: Why goslings? Why not goslings? [laughing] I have always loved farm animals ever since I was a boy. Pigs, chickens, geese, cows, sheep, guinea fowl, you name it. I always asked for toy farm animals for Christmas when I was a little boy. I still buy toy farm animals to this day and have quite a collection. And I still build model medieval farms for them to have a place to live. At the beginning of my career as a writer and illustrator my stories did center around pigs and chickens. Eddy B, Pigboy was my very first book to be published in 1983. I have always loved chickens and they appeared in most of my books as well. One of my books was dedicated specifically to a broody hen. Naturally enough it was titled The Broody Hen. Geese made appearances in my early books as well from time to time. But, it wasn’t until I moved from Philadelphia to the western edge of the Catskills that I really began to focus on bears, chickens, and goslings. EH: When did you move to the Catskills? OD: We left Philadelphia at the beginning of October 1996. I finally felt that I could earn my living as a writer and illustrator without having to remain in a large city. 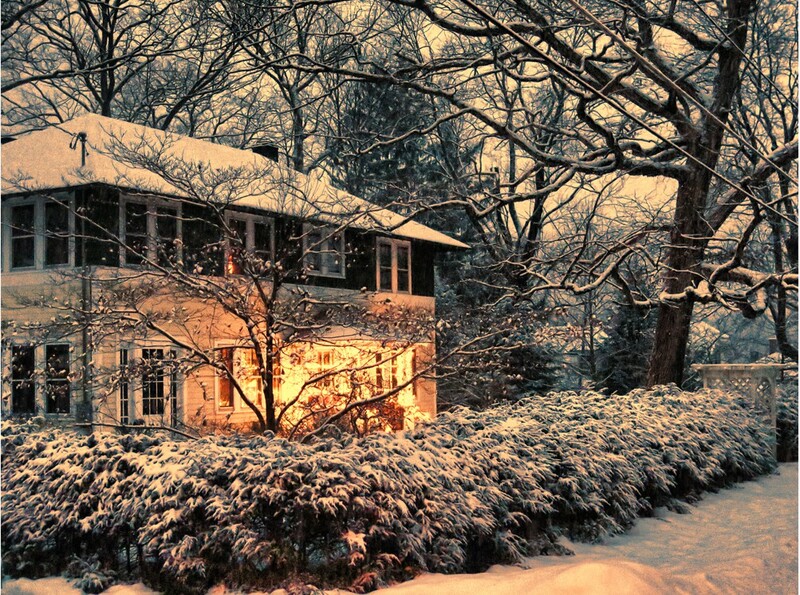 It was scary, but I had to get out of the city and I had always wanted to live in the country. I really thought we would buy a farm, but that was more difficult than I had thought it would be. EH: So you moved to the Catskills and began writing about and drawing goslings? Were there a lot of geese up there? OD: [laughing] I had just finished the illustrations, or was about to finish them, for The Painter Who Loved Chickens just before we moved. Shortly after we arrived I received a phone call from a friend in Philadelphia who was also a writer and illustrator. In fact, he was half of a husband and wife team, David and Charlotte Yue. For some reason my name had come up when David and Charlotte were talking to their editor at Houghton Mifflin in Boston. The editor asked them if they could contact me and ask me if I might be interested in illustrating a manuscript that they felt I was the right illustrator to do the pictures for the book. So, David called me and passed on the information. He had been reluctant to give my phone out to anyone and I was very grateful for his discretion. EH: What was the book? And did you illustrate it? OD: The book is titled The Boy Who Loved to Draw. It is written by Barbara Brenner. The book is about the 18th century artist Benjamin West. I had called the art director and was filled in as to what the project required. I have only ever illustrated books by other writers three times in my professional career. EH: Wait, why don’t you like to illustrate books written by other people? OD: Mostly because illustrating is very difficult for me. I am a white-knuckle illustrator that is terrified of making mistakes when I do the illustrations. And I have too many of my own ideas for stories and books that I never felt the need to seek out work illustrating other people’s books. EH: So what was about The Boy Who Loved to Draw that made you decide to illustrate it? OD: Eric, you are going to laugh. I was in panic mode after having left all my friends, family, professional connections, etc. in Philadelphia and the only reason I agreed to do that book was because I needed the money. I was nervous that we might not survive living so far away from a large city. At least in Philadelphia I knew I could always get a job as a waiter, office worker, doing massage…anything to keep afloat if need be. But having moved to a very small remote mountain village did make me feel a bit insecure as to whether or not I would be able to earn my living writing and illustrating with no safety net in place. EH: Wow! I never would have thought of that. I just assumed you were a successful writer with no financial worries and could do whatever you wanted. OD: Like most writers and illustrators I don’t think I will ever reach that point in my professional life where I feel 100% secure that I’m going to be able to pay my bills every month and not worry about money. EH: OK, back to the goslings. Where did they come from? And when did you first think of writing and illustrating the Gossie & Friends books? OD: Let me think…I did the illustrations for The Boy Who Loved to Draw that was published in 1999, I believe. The Painter Who Loved Chickens had just come out. And I wrote and illustrated Appearing Tonight! Mary Heather Elizabeth Livingstone. The turning point came when I wrote and illustrated Bear Noel, which was published in 2000. Like 1978 the year 2000 was a pivotal point in my career. I had no shortage of picture book contracts, but I really wanted to work on my magnum opus: The Lay of Moel Eyris: The Saga of the Bear’s Son. But, to get back to goslings, someone had given me a tiny pair of red rubber boots. They were probably made for a doll or something. I have no idea why they gave me these little boots. They were sitting on the shelf that sits on my drawing board. I kept looking at these boots and then one day started sketching them and they ended up on a little gosling’s feet. I thought it was funny. EH: Aha! That is interesting that you were working on so many other projects and these little red boots caught your imagination. How long did it take you to come up with the story that featured them? OD: Eric, I am not one of those writers that agonizes over the words I write. I simply write them, string them together to tell a story, and that’s it. I tend to be very direct and to-the-point when I write (unlike how I talk, I tend to ramble on and on and on!). As I was drawing the little gosling wearing the red boots I started writing: This is Gossie. Gossie is a small yellow gosling that likes to wear bright red boots. Every day. EH: And that was it? The story of Gossie came to you just like that? OD: Pretty much. I just kept writing scenes as to what a little yellow gosling would do while wearing her red boots. Simple, every day things. I wanted to keep the gosling very gosling-like and not too anthropomorphic. I knew that this gosling would speak but I didn’t want there to be a lot of dialogue. EH: When did you show these drawings to your editor? And which editor did you show them to? OD: Gossie literally came to life in a matter of days. 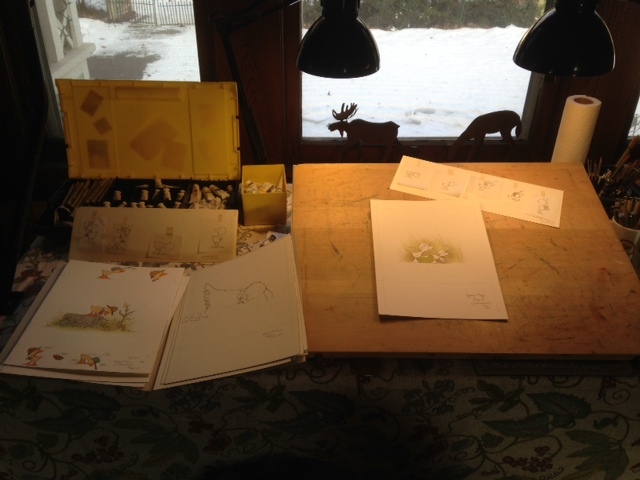 I put together a dummy with the rough sketches and words and called the art director I had worked with while doing the illustrations for The Boy Who Loved to Draw at Houghton Mifflin. I told him about Gossie and asked him if he knew an editor that might be interested in looking at the dummy and manuscript. The art director’s name was Bob, I don’t remember his last name. Bob said he knew just the editor that might be interested. She was young and had worked with Walter Lorraine. EH: Is that name significant? OD: It is. Walter Lorraine was an incredible designer and art director at Houghton Mifflin before being named Director of Children’s Books, a position he held from 1965–1995. He now heads his own imprint, Walter Lorraine Books. EH: Who was the editor? OD: Her name is Amy Flynn. She was young and had a three-year-old daughter at the time. I sent her a letter and the dummy for Gossie and waited with bated breath hoping she would like it. OD: Amy showed that rough, rough black-and-white photocopy dummy to her young daughter, Lily. Lily absolutely loved it! So, Amy called me and offered me a contract for the book. I was thrilled! I told her that I was working on a companion book to go with it titled Gossie & Gertie. This book would pick up where Gossie left off and would focus on the close friendship between the two small goslings. EH: That’s great! She offered you contracts for both books at the same time? OD: That she did. The advances weren’t very large, but it was enough money so that I could not have to worry for a few months as to how I was going to pay the bills. I had started working on the finished artwork for It’s Snowing! for Farrar, Straus & Giroux. 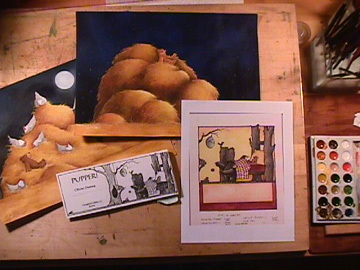 The artwork for this book was being done in the same style as that seen in Bear Noel—more painterly, more artistic, what I called my more serious illustration style. EH: Do always work on several books at one time in the studio? OD: Sort of. 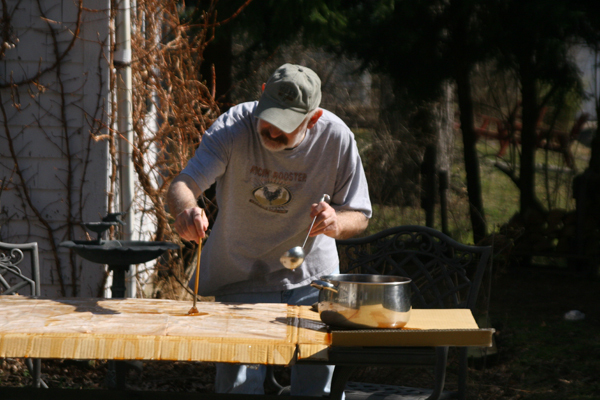 I always have a number of projects going on in different stages of development. For some the writing is finished, for others I have lots of sketches and colour studies, and then there’s always a book on the drawing board that I’m doing the finished illustrations for. I can’t keep drawing and painting the same characters over and over without some kind of break. So I work on other projects just to keep my thinking fresh. EH: That makes sense, actually. But the editor, Amy Flynn, thought that the two gosling books would become big sellers? The Gossie & Friends books are very simple stories for very young children. I wanted them to be as uncluttered as possible in design. The art director, Bob, had other ideas when we first started working together on these little books. He redesigned my layouts to include wildly coloured cartoon borders and “bouncy” cartoon type floating above the characters, going underneath the pictures, and just all over the place in the pictures. I was horrified! This isn’t at all how I saw these little books. He and I were at odds as to how the finished books should look. I was insistent that the books would have lots of white space and that the simple text of the story would always, ALWAYS, appear below the art. I did not want the words to be part of the picture in any way, shape, or form. EH: What happened? I mean, I know you got your way because the books look exactly the way you wanted them to, right? OD: I was very lucky to have had Amy Flynn as my editor. She agreed with me. From the very beginning Amy and I just clicked and worked very well together as writer and editor. She instinctively understood what I wanted and she supported me. I was so relieved, let me tell you. EH: I can tell that you are passionate about how your books look and are presented to the world. I never realized that you had to fight so hard to have a book be published the way you wanted it to be. OD: Ah, Eric, the stories I could tell you about the battles I lost or the times I gave in believing that the editor’s judgment was better than mine. I was young when I first got published and I tended to let editors and art directors “guide” me all along the way to seeing my books published. A few of my favorite books were mangled and changed far beyond my original concept. I will never let this happen again, trust me. I know quite well how I want my books to look and be read. EH: I can’t imagine you letting someone else have control over your creative work. But, it seems like you found the right editor for Gossie & Friends. OD: Fate works in mysterious ways, as that old saying goes. Amy was the right editor. She never tried to change my concept or design for Gossie & Friends. And she knows exactly how to get me to stay focused on ONE concept per book. When I first wrote Peedie, the little yellow gosling that loves his red baseball cap and is forgetful, Amy called me and explained that I really should only introduce ONE concept in these little books. She said Peedie should be either forgetful or passionately love his red cap. The final solution was to have him to both, but I kept the emphasis on his being forgetful—he forgot where he had left his beloved red cap. Amy is one of the best editors I’ve ever worked with. She nudges me to think about a word or idea rather than dictate or demand that I change something. From the outset I had told her that I envisioned an entire series of little gosling books. Hence the “Friends” in the overall collective title. I also knew that if Gossie and Gossie & Gertie did not do well in the marketplace there would be no more gosling books. And, you might have noticed that Peedie is dedicated to Amy’s daughter and son, Lily and Bobby. The very daughter that really was responsible for me getting the first contract for Gossie. EH: That’s terrific! I had wondered who Lily and Bobby were. I think it’s great that you dedicated a book to your editor’s children. It sounds like you and the goslings were on probation and under a lot of pressure to prove yourselves! OD: No, I didn’t feel that way at all. Eric, to be honest, I did ALL the finished illustrations for those first two Gossie & Friends books in two weeks! Two weeks! I worked night and day. Remember, the art is very simple and uncluttered. I drew all the layouts first in pencil, then did all the inking, and then all the painting. I’d never worked this way before. I knew that it was important to keep the characters and colours as consistent as possible and this was the method that worked best fro me and these little books. Also, I don’t like to overwork or overthink a story or an illustration. I can easily spend way too much time on a picture and absolutely ruin it. EH: When did those first two books get published and when did you know that those two books were a hit? OD: Gossie and Gossie & Gertie came out in 2002. And they made a big splash (no pun intended) as soon as they hit the book stores. Sales were strong from the outset and Amy had called me right away to ask if I had any more gosling books in the works. I told her that I was working on a quirky, headstrong little gosling named Ollie. I had decided in my mind that there would be a gaggle of thirteen goslings—a baker’s dozen—for all the books, if the series did indeed come to be. And I knew that not all the goslings would be yellow. I didn’t worry about being politically correct, I just knew that I would get bored drawing and painting only yellow goslings. And if I would get bored, readers would probably get bored, too. EH: That’s why you have brown, blue, yellow, white, grey, and black goslings in the series. Just for variety? OD: Exactly! As a writer and illustrator it’s more fun working with a variety of goslings that are not only different colours, but different sizes. It gives me a lot more room to play with the dynamics and relationships between them. Some are best friends; some are brother and sister, and so on. EH: How did you decide on the personalities of each gosling? I know that the reviews I’ve read all seem to praise your accurate assessment and understanding of the two year old mindset. Is this true? Do you know a lot of toddlers and test out your stories on them to see what they like, what they respond to best? OD: Good grief! NOT at all! It does amuse me that people think I have this built in understanding of the toddler mindset. I really don’t. I simply write stories that I like, that I find funny, and like to feel engaged with. And when I do the illustrations I am simply trying to make the most interesting layouts/compositions that I can that will look interesting on a white page in a book. To me, it’s all a matter of problem solving. EH: But, each gosling has such a distinctive personality. Whether it’s being a bit bossy, obsessed with food, or being very quiet. Do you just make up their personalities in your head? OD: Not exactly. Here’s the secret of the goslings’ personalities: each gosling is based on one of our dogs’ personality. We really did have a cocker spaniel named BooBoo that was obsessed with food and eating. She was the most overweight dog we’ve ever had. We could not deny her all the food she wanted. We are very involved with shelter dog rescue and each of our shelter dogs came to us thin and hungry. EH: I knew that you had a number of dogs and had read on your website that you were involved with rescuing shelter dogs. So the goslings are really our dogs in disguise? OD: Pretty much. And a few of my friends as well. Ollie is based on my best friend, Wayne Wright. Wayne died just before we moved away from Philadelphia. Ollie is my homage to him. 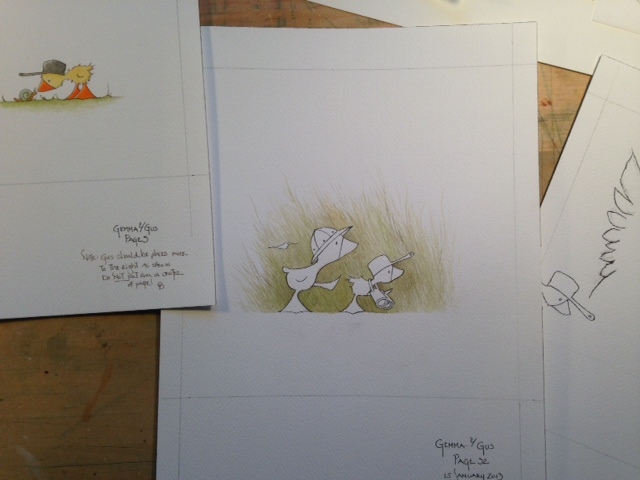 EH: Did you have the structure in mind for the entire series when you started writing and illustrating Gossie & Friends? OD: Yes, I did. Because the books are small in size Amy and I thought it would be a good idea to have two companion books published together at the same time. And it works. The first two books are Gossie and Gossie & Gertie. Then came Ollie and Ollie the Stomper. Next was Peedie and BooBoo. And so on. I think the only book that was published by itself was Jasper & Joop. EH: I love the names of the goslings that you come up with. Any insights as to where you get the names from? OD: I wanted all the names to sound like names that goslings would have. The names should be short and friendly. If that makes any sense. I knew that the letter “G” would be a letter that a number of names would start with. The other names just seem to fit. EH: What are all the names of the goslings in the series? OD: Gossie, Gertie, Ollie, Peedie, BooBoo, Gideon, Jasper, Joop, Gemma, Gus Ruby, Roofus, and Pearl. EH: I can tell you have those memorized! OD: I do. I live with these goslings every day. They really have taken on a life of their own, with or without me. EH: How did they come to be published in other countries around the world? Was that your idea or your publisher’s? OD: Honestly, I had nothing to do with the subrights sales of the books. That is handled entirely by my publishers and their subrights managers. I only have to give my permission once an offer from a foreign publisher comes in. EH: How do you like working with foreign publishers? Do you do all the translations yourself? OD: I don’t work directly with any of my foreign publishers, except one—Gottmer in the Netherlands. I don’t do any of the translations for the books. I leave all that to my editors and publishers to make sure that the translations are the best they can be. EH: Why do they change the name of your characters when the books are translated into other languages? And how do you feel about that? OD: There are various reasons that foreign publishers change the names, as I learned over the years. The principal reason seems to be that the original name in English might mean something else or sound like something else (and not flattering) in another language. For example, Ollie was problematical because my French publisher thought it sounded too much like ‘au lit’—go to bed. And my Dutch editor explained that Gossie in Dutch sounds too much like a not-so-nice word in Dutch. EH: Have you ever not liked a name change for your characters for some reason? And why do you only work directly with your Dutch publisher? OD: Yes, I will admit that some of the name changes I was not at all happy with. But, I’ve gotten used to them. For example, I was horrified when my French publisher changed Gossie and Gertie to Lola and Olga! I asked for an explanation and requested that no name changes be made without consulting with me first. Just as a courtesy. And the reason I work with my Dutch publisher is this: I met them in person in February 2014 when I had gone to Belgium to visit the Hergé museum. I felt that since I was so close to the Netherlands that I should make some effort to at least meet my Dutch publisher and editor because they do so many exciting projects with my books. And my books are strong sellers in the Netherlands. EH: What was it like to meet one of your foreign publishers? OD: It was great! They do so much on my behalf and made me feel so welcome. My editor knows that I love speed skating and had been following the Dutch speed skaters at the last Winter Olympics. They wanted to get me an official Olympic Dutch knitted cap. But, they weren’t available. My editor had a woman knit me a Dutch Olympic hat just like the ones the athletes wore in the Winter Olympics! I was thrilled! I can’t produce the Gossie & Friends books fast enough so my Dutch publisher comes up with a number of interesting editions for my books to keep the buyers happy. EH: What sort of editions? OD: They produced a stuffed toy Gossie/book combo package for example. And the stuffed Gossie is perfect! They had a vinyl bathtub edition made as well as printing two-books-in-one that could be sold at an affordable price. They produced boxed sets of miniature books that parents could by as party favors. Two of the most exciting things they are working on is a puppet show based on the books that will be performed in the Netherlands. And they had the most talented Dutch singer/songwriter record the official Gossie & Friends theme song. Her name is Ageeth de Haan. Her voice is THE perfect voice that fits the books and characters. Ageeth and I have become friends and worked together on the English version of the song. You can hear her singing the Gossie & Friends theme song at my website. I have heard other actors and readers record my books for audio CDs or videos and I haven’t been all that wild about them. But, Ageeth’s voice is perfectly suited for the goslings. Gottmer hopes to work on animated versions of Gossie & Friends and will use Ageeth’s song to introduce them. EH: Wow! That is exciting! Your books aren’t just published in other countries but there are some interesting projects in the works as well. OD: Exactly! And I couldn’t be more pleased. It’s why I say that the goslings have a life of their own with or without me. They have exciting things happen to them that has nothing to do with me! And it’s the same for Old Bear and Little Cub. They are taking on a life on their own as well. But, we’ll save talking about them for another time. EH: So, since 2002 the goslings have been a big part of your life. Are you as excited about them today as you were when you first created them? OD: The goslings keep trying to take over my life, believe me! Yes, I love the goslings and as the series progressed I did get better and better at designing the books and doing the layouts. At least I think so. By the way, in 2005, I think that was the year, the first Hollywood studio came knocking on the door interested in the movie, tv, and DVD rights to Gossie & Friends. EH: Wow! Really? That is exciting! Is there going to be a Gossie & Friends movie? OD: You never can tell. But, what was interesting was the fact that I had kept all the licensing, movie rights, etc. for myself. The subrights manager called me when Sony Columbia Pictures contacted her regarding whether the licensing rights were available for the series. OD: The subrights manager and I had a long, intense discussion about it. I told her that another production company in Hollywood had already contacted me and we were talking about optioning the movie/tv/DVD rights. She asked what it would take to get me to turn the licensing rights back over to Houghton Mifflin. It’s too complicated to try and explain it all to you now, but I did, in the end, wind up signing the rights back over to Houghton Mifflin. EH: Are you happy that you did that? She must have been a pretty persuasive subrights manager. OD: [laughs] She was. And, considering the bigger picture, I got quite a bit in exchange for giving the rights to my publisher. And, to be honest, I really did think that their Hollywood agent, legal team, marketing people, and subrights people would do a much better job at negotiating a deal than I might have been able to do. Not to say that I don’t think I couldn’t have handled it all, but I was a bit relieved to let them deal with the nitty gritty negotiations. The only thing I asked for was final approval on any and all design and licensing decisions. My editor, Mary Wilcox, is terrific about keeping me up-to-date on anything that comes along. EH: It sounds like there is a lot of trust involved on your part. You really turned everything back over to them to handle for you? OD: Yes, trust is one of the most important things in any relationship, professional and personal. And, I have no reason NOT to trust my publishers, especially Houghton. They have been very patient with me and have treated me very well. I am lucky to be working with some of the best and brightest editors, art directors, book designers in the publishing industry. You would be amazed at what they do to make my books be the best they can be. Over the course of the past ten years there have been a number of Hollywood studios and even a production company in London that expressed interest in optioning the Gossie & Friends series. I try to stay focused on simply writing the best stories that I can and making the books as lively and interesting as possible. Nothing happens quickly, that’s for sure. EH: And you don’t seem to get caught up in all the hype about it which is good. I’m curious to know about the setting for Gossie & Friends. It seems like all the stories take place on the same farm and you can see other farm animals and buildings that give a sense of place for the stories. OD: All the Gossie & Friends stories are set on Old Farm. In order to keep the story lines and setting consistent I drew and painted a Projection Map of Old Farm. This map shows exactly where each farm building is located, where the pond is located, the beehives, pumpkin patch, apple tree, etc. Every time I write a new story I only have to look at the map in order to figure out where the main action of the story will take place or how I can move the goslings around Old Farm in a logical and interesting way. I even drew an aerial map of Old Farm so that I can easily visualize the entire farm. EH: How big is Old Farm? It seems like it’s huge! OD: Ah, Old Farm actually only sits on an acre of land and is enclosed by an ancient stone wall. You have to remember that an acre would be a large world to the small goslings. It’s a safe, self-contained world. I think part of the success of these little books is the fact that young readers can easily identify with the goslings as they make new discoveries, come across something unexpected, interact with other farm animals—sheep, goat, cow, pigs, piglets, ducklings, hens, chicks, dog. In addition to the farm animals the goslings also encounter other animals: hedgehogs, moles, bats, mice, insects, frogs, turtles, and so on. The goslings have simple adventures but to them they are BIG adventures as they go about discovering their world. And each new animal or insect adds more interest to the adventure. EH: As always, Olivier, I am amazed at the amount of details you put into your stories, no matter how simple they first appear. I remember being fascinated by all the details in your books when I was a young boy and I still find them just as fascinating today. I only have one final question: When will Gossie & Friends be brought to an end? Have you thought about how you will wrap up the series? OD: Eric, in my mind I had only thought about each gosling being introduced in one or two books. 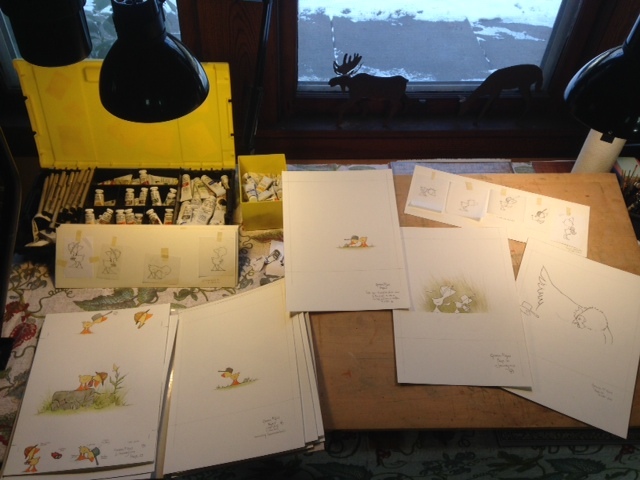 My publisher, Houghton Mifflin Harcourt, had asked many years ago if I would write and illustrate a few holiday books. These were published as Merry Christmas, Ollie!, Ollie’s Halloween, and Ollie’s Easter Eggs. And this December Ollie’s Valentine will be published in time for Valentine’s Day 2016. In addition to the holiday books, HMH produced a number of other books that they put together using my artwork to create specialty books: Gossie’s First Lift Tab Flap Book; Gossie’s Busy Day; Gossie Plays Hide-and-Seek as well as board books, larger padded board books, a tower gift box set of books, and other editions. I have four remaining Gossie & Friends books to finish in order to wrap up the series, as you say: Gus & the Hatchlings; Ruby & Roofus; Pearl; and Pearl’s Lost Pearls. IF there is still a demand for the goslings and if I think I can create strong, interesting, unique stories, there could be other books. For example, I could see doing any number of books where I mix and match various goslings to tell new stories. And I’m pretty sure that at some point my publisher will ask for a book(s) that feature all thirteen goslings. My prediction is that Pearl is going to steal the show! She’s going to be fabulous! EH: What makes her so fabulous? So the series really could go on and on? OD: Pearl is fabulous because she’s the smallest gosling and is probably the feistiest. In my mind I see her as a tiny, pint-sized diva with her pop-pearl necklace. No, I don’t think it will go on and on. But, I do think there could be a few more interesting stories added and possibly a few guest goslings introduced. I’m not even sure I should tell you that I have actually written out 110 story lines for the gaggle of goslings! EH: Guest goslings? And 110 story lines? That is incredible! And what in the world is a pop-pearl necklace? OD: Eric, you are too young too remember the fabulous plastic pop pearls that we kids in the 1950s used to play with and wear. They were oversized plastic pearls that popped together so that you could make necklaces any length you wanted. They were probably the best thing ever invented! I wonder if they are still made today? And, like I said, I always envisioned thirteen goslings would comprise the gaggle of goslings. But, I have created a few other goslings with great names that I would hate to toss by the wayside. And in the back of my mind I always have story ideas for the goslings. Just in case. EH: Can you tell me their names? OD: Sure. Rose and Petal, Gunnar, Gussie are a few. Rose and Petal are pinkish twin sisters that are hat obsessed! I just think they could shake things up on Old Farm if they came for a visit. Gunnar has really big feet, like me. And Gussie is a name that I borrowed from the Wooster and Jeeves books by P. G. Wodehouse. Gussie Finknottle is one of the characters in those books whose name I always got a tickle out of. EH: I’ll have to take a look at those books. Olivier, thank you again for taking the time to sit down with me and share your thoughts and insights into your work. OD: Eric, it’s been a pleasure. I really do appreciate your taking the time to ask such thoughtful questions. I’m not certain anyone else will find all this information interesting except you and me. EH: Trust me, I think a lot of people will find all this information interesting. A few days after Olivier and I sat down to talk about Gossie & Friends he sent me an email with an interesting afterthought. He pointed out that the prominent theme, or pattern, that can be seen in his books, from Gossie & Friends right up to The Lay of Moel Eyris: The Saga of the Bear’s Son is the fact that each series is confined to a set limitation in terms of geography. Gossie & Friends will never set foot outside of Old Farm. The inhabitants of Moel Eyris are pretty much confined to their island world. Old Bear and Little Cub are bound to stay within the realm of the Northwoods and will never have contact with humans, or any other inhabitant of the islands. Olivier pointed out that most people he knows seldom travel very far from their own home turf and it was this idea he subscribes to for his characters. Part Ten: Conversation with Eric Hemmers — Where Did the Idea come from for ‘The Lay of Moel Eyris: The Saga of the Bear’s Son’? Part 10: This conversation is in ten parts. EH: How do you keep all this information straight in your head? It’s mind boggling the amount of detail you have put into LOME! OD: Eric, you have to remember, I’ve been working on, thinking about, revising and tweaking this mythology since 1978! That’s more than thirty-five years! I know this story so well, inside and out. Now, to be honest, I also keep files and files of lists, ideas, concepts, etc. in order to keep everything absolutely accurate in my writing. I have Word Lists that contain every word that is invented or not overly familiar; I have a Trow Word list; a Geography Word list; a Characters Word list, and so on. I keep detailed notes on Ideas and Concepts—where I might get an idea from what I read or hear or see and when it comes to me and becomes incorporated into the mythology. I’ll give you a quick example of a new concept/idea that I only recently added to the geography of Moel Eyris: Salt marshes. I knew that I wanted there to be a Fenland (the Fens) that will be an eerie place where ‘Broken Men’ can hide and not be found for whatever reason. I wanted this place to be a place of mystery and danger. In the summer and autumn of 2014 John and I spent time on Cape Cod and in Provincetown. We walked across the Breakwater and hiked through the salt marshes. I was completely captivated by the salt marshes and the tidal flow in and out of them and how easy it was to hide amongst the tall grasses. So, I knew I had to include salt marshes in the story. When I began thinking about the salt marshes and the Fens it became obvious that this region had to be a natural dividing line between the northern skeelings and the southern skeelings. And this area could act as a natural protective barrier to Eynhallow. Of course, it also meant that I would have to draw and design yet one more FINAL Myvyrrian Map for the story/mythology. This I have done and it works perfectly! EH: Do you have any idea when you will finish the writing for LOME? OD: The first book has a number of chapters and the Prologue already written. I got sidetracked by a new novel, Wythe’s End, that I wrote eighteen (out of twenty-eight) chapters for. Wythe’s End just came to me in a flash as a reaction to having to draw too many goslings and too many bear cubs over and over and over. I needed to do something completely different to save my sanity! The interesting thing is that in writing the chapters for Wythe’s End I learned a great deal as to what I want to do with the writing for the five books in LOME. EH: You realize you’re borderline schizophrenic, right? OD: I know! It’s scary at times! There’s one thing about writing that makes it easier for me than illustrating. I am a fast, super fast, typist. The actual mechanics of writing, the tapping away at the keyboard, goes very quickly. In that I don’t have to think about the physical act of writing my mind is free to just think the story. When I write I only think about the writing and it simply flows. I don’t worry about making mistakes, those can always be fixed later. I don’t worry about sequence. I just let the story flow out of my fingers and into the computer. Now, before you think I’m making writing sound like something that just comes and there’s no thought behind it. I have to say that most often I lay in bed at night thinking about a scene or a chapter and writing it out in my mind. I do this night after night, week after week, sometimes month after month. And then when I sit down to write it all out, it just comes. All the thinking has already been done. At this point it’s simply a matter of furiously typing as fast as my fingers will go and get the words into the computer before I forget them. EH: What is your greatest worry in regard to getting all this writing finished? OD: Well, I think it’s obvious. My greatest worry is that I will die before I do get all the writing finished! But, on a happier note, I only have a handful of picture books to finish this year and then I am a FREE man! I can concentrate on what I call my ‘larger writing’ to my heart’s content. Honestly, I think it would only take three to six months to finish writing the first book in LOME. And, I could easily finish writing Wythe’s End in two months. Writing really does come much more easily to me than illustrating. But, I won’t allow myself to finish the writing until I finish the last outstanding picture book contract. I am heavily bogged down by guilt until I get those picture books finished. EH: Olivier, thank you so much for taking the time to explain all this to me. I truly appreciate it more than you know. There is so much more I am dying to ask you. But, it sounds like I’ll have to wait until the books come out. Good luck in finishing this magnum opus of yours! Part Nine: Conversation with Eric Hemmers — Where Did the Idea come from for ‘The Lay of Moel Eyris: The Saga of the Bear’s Son’? Part 9: This conversation is in ten parts. EH: You have often been cited as referring to LOME as YOUR Lord of the Rings. And I can see that what you mean is that you have created your own distinct world in great detail, just like Tolkien did with Middle Earth. Do you ever think of your story, the books, as being similar in any way to the Harry Potter books? And, do you think your narrative has an overall theme or pattern? Good versus evil? Man versus nature? That sort of thing. OD: Whew! Let me answer your last question first, since it’s the one that is freshest in my mind. There is an overall theme and pattern, as you put it, in the five books. And that would be: the power of ritual. In the story the islanders, the characters, live by a prescribed internal sense as to where they belong in their world. For them it is the power of ritual that keeps life in balance. Each individual or group has their particular, their specific rituals that they perform, that they believe in with all their heart to keep their lives and their world held together. Whenever anyone’s life is out-of-balance that’s when disaster seems to strike most often. In our modern world I honestly believe that what is missing from peoples’ lives is the power of ritual. Performing a task in such a way that you do time and time again in just the right way so that you keep yourself in balance. My own life is filled with more little rituals than you could ever begin to imagine. In performing them I keep myself centered and in balance and help keep my sanity intact. So, yes, it’s the power of ritual that creates the patterns in this story. And, perhaps, this power of ritual is most clearly seen in the five Initiations that each maolt must undergo in his pursuit to become a maol; a man/bear/trow, and so on. EH: I know, I lumped a number of questions together. I wondered what you thought of the parallels that will probably be made between LOME and the Lord of the Rings and the Harry Potter books. OD: I do that all the time. I tend to ask a string of questions as they pop into my mind and expect the person I’m asking to be able to answer them all in chronological order! First of all I would have to say that it is the Lord of the Rings and other Tolkien writing that has influenced me the most. I see more similarities between my story and that of Tolkien. We are both telling a ‘quest’ story. Fulfilling one’s destiny no matter what the cost or odds. Secondly, the Arthurian legends are another major influence for obvious reasons. Thirdly, I’m pretty certain that people will compare my books to the Harry Potter books mainly because 1) the story starts off with a young boy going off to study and 2) there is a seemingly neverending struggle between the boy and the character that manifests evil to its maximum degree. In LOME, however there is no wand-waving magic. The magic that can be seen is more an authentic earth magic—a belief in the power of ritual, and mind over matter, you might say. Cael does not become a maol in order to perform magic. Even though, one of the five Initiations does require him to master a difficult task in identifying and knowing how to find the rare doors that lead into the Realm of Faërie. But, this concept is not performing magic per se. It really is more about understanding the hidden facets in life. It simply requires keen observation, listening to your heart, and being able to perceive subtle changes around you. To me that’s not magic. It’s a matter of being ‘aware’ of one’s self in the cosmos. Now going back to the power of ritual and patterns in my story the structure of the five books falls into what is called “the Bear’s Son Cycle”. In its basic form the motif tells of a child whose human mother has been abducted by a bear or falls in love with a bear; the bear may be the child’s father. The child acquires bear characteristics and superhuman strength as he grows, and on is return to human society proves himself by a series of extraordinary feats. In such tales it is common for the hero to battle with a monstrous evil. And then, to compound this motif with another you have to factor in what is called the “beast marriage”. The motif of a human married to a beast is found in folktales around the world, with many variations. One variation is the lover who is a beast by day and a man by night, or can otherwise change between the two shapes. In Moel Eyris it was taboo for a human and a beast (bear) to marry. Cael’s parents broke this taboo and he is the result of their forbidden union. Cael’s father, Brom Powys, is a bear who can assume the form of a man [he inherited this ability from his father and grandfather and his ancestors before him]. He falls in love with Hanne Tulloch, an island girl. Hanne falls in love with Brom as a man not knowing his true form. The two are married in secret. Brom reveals his true identity to Hanne in anticipation that she will reject and abandon him. Hanne, however, loves Brom with all her heart and remains true to him despite the fact that he is a bear. It is these two motifs, the bear’s son cycle and the beast marriage, that was the genesis for Cael’s story. The details come from my travels in Scotland and my love of Neanderthals. And perhaps most importantly my love of stories and books. Mythographers are the ones that make certain stories are never forgotten; books are treasures beyond measure. Oh, and there is perhaps one final pattern or theme that I should mention. It ties in with the power of ritual more or less. Maols spend their lives learning the myths, the stories, the histories of the islands and of the world. They are educated and value nothing higher than knowledge and learning. Christianity has no place in my mythology. The only passing reference to it is when Maol Rudha makes reference to the fact that there are some societies that will only listen to the “one story” and no other. Learning and knowledge is a privilege in Moel Eyris and is not something that can be undertaken lightly. Maol Rudha is a firm believer in keeping knowledge in the hands of the maols and at Moolstery and being on hand to guide the islanders’ lives, quarrels, disputes, punishments, etc. Cael, having lived the first twelve years of his life ‘off-island’ and having attended public school in the United States, has a very different view in regard to education. He truly believes that everyone should have the right to learn and be educated. It is on this point that he and Maol Rudha are at loggerheads. Maol Rudha observes that most islanders, and people in general, have very little interest in learning and understanding. Therefore, education should not be wasted on those who show no interest or aptitude for it. This particular theme will be an important thread running through the five books.